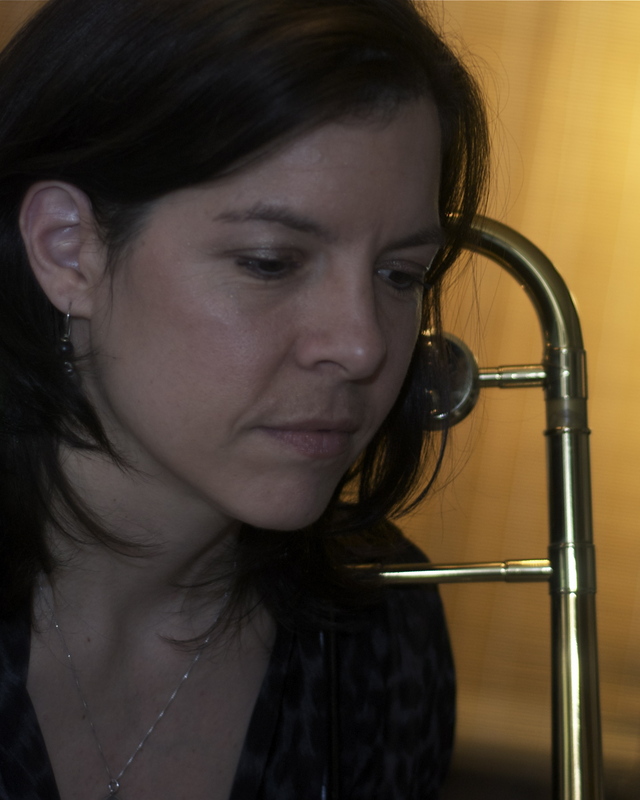 California native Jennifer Krupa attended the University of North Florida to study with Rich Matteson, Bunky Green, and Jack Peterson and graduated with a Bachelor of Music in jazz studies. After graduation she stayed in Florida to work for Universal Studios and Walt Disney World, performing with the Studio Brass and Show bands at Disneyworld, as well as with the Benny Goodman Orchestra under the direction of Bob Wilbur, the Larry Elgart Orchestra and the St. John’s River City Brass Band. A scholarship offer at the New School brought Jen to New York in 1998. After attending the New School for one year she opted to take a break to freelance in the city. In 2001, Jen was accepted into the inaugural class of The Juilliard School’s Institute for Jazz Studies, earning an Artist Diploma in jazz studies two years later. At Juilliard Jen studied trombone with Wycliffe Gordon and arranging with Ellington aficionado David Berger. As part of the Juilliard program she performed with the Juilliard Jazz Orchestra under the direction of Victor Goines at Alice Tully Hall, at the New Orleans Jazz and Heritage Festival, and at various locations in New York City. She also performed with and composed for the Juilliard School Small Group Jazz Ensemble. In addition to her activities at Juilliard, while in New York Jen performed with Wynton Marsalis and the Jazz at Lincoln Center Orchestra, Davis Berger’s Sultans of Swing, the Wycliffe Gordon Quintet/Sextet, the Warren Vache Quintet, the Blue Saracens, the New York Ragtime Orchestra, and the Choro Ensemble, in addition to leading her own small group. In 2003 Jen won a position in the prestigious IAJE Sisters in Jazz Collegiate Quintet. With that group she performed at the IAJE Convention in Toronto, Ontario; the Kennedy Center in Washington, D.C.; Jazz à Vienne in Paris; the NorthSea Jazz Festival in the Netherlands; and the Umbria Jazz Festival in Italy. Also in 2003, Jen attended the Henry Mancini Institute, where she studied and/or performed with Patrick Williams, Christian McBride, Arturo Sandoval, Andy Martin, and Bill Cunliffe while performing with the Orchestra, big band and small groups in concert in the Los Angeles area. In 2004 Jen auditioned for, and won a job with the United States Navy Band Commodores jazz ensemble. Since joining the Commodores, Jen has participated in five national concert tours, and performed with artists Branford Marsalis, Chris Potter, Bill Watrous, Seamus Blake, Eddie Daniels, Mike Vax, Antonio Hart and Jane Monheit. The Commodores have recorded two of Jen’s arrangements: “Freight Trane” on 2005’s “3 Shades of Blue,” and “Four On Six” on “Directions,” released in 2009. Since moving to Washington, D.C., Jen has formed her own group, JLQ, with saxophonist Leigh Pilzer. JLQ is inspired by the duo collaborations of such pairs as Gerry Mulligan and Bob Brookmeyer, J. J. Johnson and Kai Winding, and Al Cohn and Zoot Sims. In addition, Jen has played regularly with the Smithsonian Jazz Masterworks Orchestra, led by Musical Director David Baker; and continues to perform and record with Sherrie Maricle and the DIVA Jazz Orchestra. In April 2006 Jen conducted the University of Scranton Concert Band and Choir in a performance of her compositions, commissioned for the 23rd Annual World Premiere Composition Series Concert. Jen earned her Master of Music in jazz studies from the University of Maryland in August 2010. Hey, Jen Krupa — I met you years ago, at IAJE, I think thru Ingrid Jenson at a Bob Brookmyer panel tribute — sounds good even if only partly true. You should try to come out and guest with Montclair Big Band!! That is so cool that you are in the Navy Commodores — my dad, not a musician, was in WWII on a tiny LCF boat. My service to country is limited to producing jazz concerts.